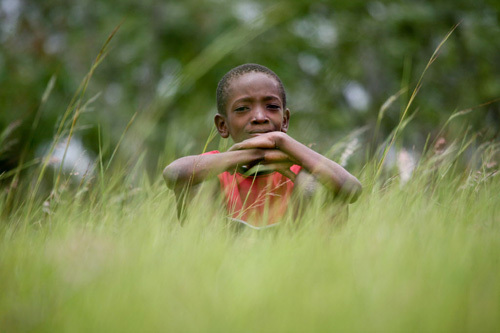 When Angela Zoerb first laid eyes on Alpha, it was in a picture from one of World Vision's sponsorship profiles. As soon as she saw the small Rwandan girl posing shyly in a bright red dress, the nurse from Vanscoy, Sask. felt convicted to make a positive change in both of their lives. "Growing up, I'd never thought I was wealthy," says Angela, who first felt compelled to fight child poverty after an overseas trip in her teens. "But to see children who had nothing, no hope and not even the basic necessities of life, I realized that I was -- and that I had to be part of the solution." 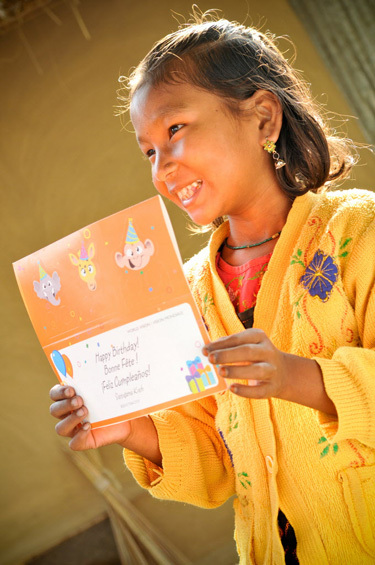 In Bangladesh, Sottogama loves receiving mail from her Canadian sponsor. Years later, Angela sponsors four children from three different countries. But she's always yearned to travel even further in her journey to change lives. "In 2012, I decided I needed to go overseas with World Vision," says Angela, who volunteers with the organization back home, just outside of Saskatoon. "I really wanted to witness the work of sponsorship with my own eyes. That way, when people come up and ask me: 'Do you believe the children are real? Do you think it makes a difference?' I can actually say, 'Yes, I've seen it.'" Angela registered for one of World Vision's Destination Life Change trips, for volunteers looking to take their sponsorship journey one giant step further by volunteering overseas. Her destination was Rwanda, and the village of the little girl she'd only seen in a photograph. In Zambia, sponsorship means Emmanuel can attend school as well as watching his family's thriving herd of goats. After a long journey by plane and van, Angela finally arrived at Alpha's home. There, she was thrilled to see the same little girl in the same red dress, waiting outside with her grandmother. "I thought she'd be excited to meet me and talk to me," recalls Angela, of those first few minutes with the child she'd circled the globe to see. "But she was so shy and I was a little disappointed." It wasn't until Angela saw a video of her visit with Alpha later on, that she realized the little girl hadn't just been shy, but awed. "Every time I looked away from her and to her grandma, she would look at me with these eyes of amazement," says Angela of the footage. "You could tell she was just so overwhelmed with all that was going on." In this, Alpha is just like many children who benefit from sponsorship. While they might be shy meeting new people from overseas, actually spending time with their Canadian sponsor is one of their fondest wishes. "Out of all the kids we visited, including my sponsored child, not one asked us, 'What did you bring for me?'" says Bryan Bosley, another Saskatchewan sponsor who visited Rwanda with World Vision two years ago. "The only question any of them asked us was, 'When is my sponsor going to come and visit me?'" In India, Grade Six girls attend school thanks to Canadian sponsors. Although many children dream of a visit from their sponsor, visits like Angela's and Brian's are not attainable for every donor. For most of the Canadians who know the joy of sponsorship, the letters, drawing and updates sponsors they receive from overseas bring more excitement than many had imagined possible. Particularly when the update contains an account of a thriving, healthy girl or boy who's doing well in school. It's the kind of impact that Angela can understand since visiting Rwanda, where she was able to see how her contribution for Alpha, pooled with gifts from other Canadians, benefited not only her sponsored child -- but the entire community. "We saw just how impactful the programs are for these families," she says, recalling the story of parents who had received specialized agricultural training as a result of the child sponsorship program. Crops thrived where they'd withered before, meaning parents could save money and better provide for their children. As for her journey with Alpha? Angela is just excited to continue her relationship with her young friend in the red dress. "I'm eager to write her the next letter and send her the photos I took of us together," she smiles. "Now she knows who I am and understands that I want to support her. And now, after seeing her, I can understand a little better what she's been facing. Now, I can truly encourage her." Angela Zoerb is just one of the 16,000 Saskatchewan residents who together, sponsor more than 20,000 children through World Vision Canada. Today, World Vision launches its Just One Child sponsorship campaign throughout the province in malls and with the help of local door-to-door fundraisers. The campaign, which will aim to find sponsors for 2,000 children around the world, will run from February 4 until April 30 and has the unwavering support of local sponsors like Angela, who have seen their gifts in action. It's always a good time to sponsor a child, no matter where in Canada you live. To begin the sponsorship journey, learn more about sponsorship, or the Destination Life Change in which volunteers travel overseas, you can visit the World Vision site.